Posted on Wed, Mar 14, 2012 : 2:15 p.m. Residents in Chelsea Springs, a Sylvan Township subdivision on the outskirts of Chelsea, will have a work session with the City Council in early April to delve further into possible annexation into the city. 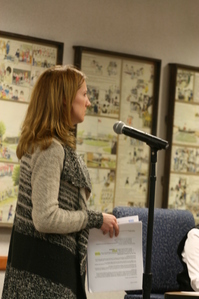 Tuesday night, Deneil Harney, president of the subdivision’s homeowner’s association, told the City Council that although residents chose to live in the township, they’ve become increasingly disenchanted with the treatment they’ve received from township officials. Deneil Harney, president of the Chelsea Springs Homeowners Association, addresses the Chelsea City Council about possible annexation into the city. In November, Sylvan Township voters rejected a 4.75 mill tax levy that would have paid for about $13.2 million in sewer and water system debt as well as $1.25 million owed to the Washtenaw County treasurer over 20 years, which is the result of a lawsuit by a developer. The township is unable to make its May interest-only bond payment for the utilities and is facing an undetermined tax increase later this year. There are 51 homes in Chelsea Springs, Harney said. Hanifan reminded the Sylvan Township residents that in addition to the library, school and fire millages that they pay, Chelsea City residents pay more than 11 mills for operations. Sylvan Township residents pay less than 1 mill in general fund taxes. Thu, Mar 15, 2012 : 10:56 a.m. They also forget that even if they do get annexed into the city, they will remain responsible for their share of the Sylvan Township debt in addition to the extra millage from the city. Wed, Mar 14, 2012 : 8:30 p.m.